The Aloha! Cluster Pays online slot is one of NetEnt’s more unusual games, and that's saying something considering they are the minds behind Spinata Grande and Wonky Wabbits. 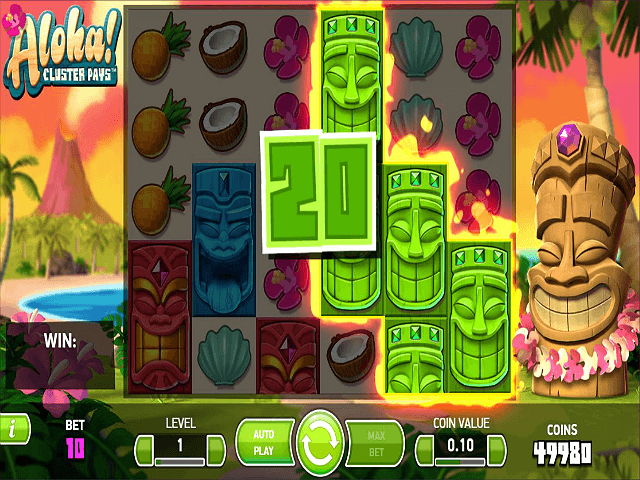 The Hawaiian-themed video slot features six reels and five rows, but not the typical number of paylines found among the top NetEnt slots. Instead, the aim of this unique payline structure is to form clusters of symbols in groups of nine or more. You'll have to dive into this Aloha! 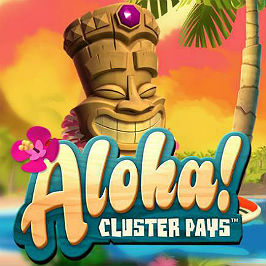 Cluster Pays slot review to find out more and see why you should don a flowery lei for good luck! Play Aloha! Cluster Pays for Real Money! Aloha! 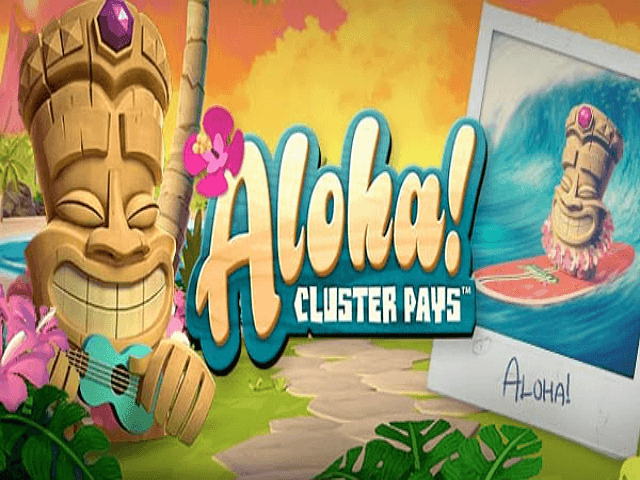 Cluster Pays has a relaxing, holiday theme, with cartoon-style Tiki statues that come to life to help you win amidst the Pacific Island setting. The curious cluster mechanic makes for a distinctive 3D slot game design, while software provider NetEnt ensures the animation is slick and bursting with colour. The relaxing music plays over the sweeping sounds of the ocean and chirps of birds, making you feel as if you're on holiday. When players form a cluster, the board will light up on fire, while the ever-present Tiki statue will help you celebrate your win, laughing and gasping and doing a little hula dance. Not only is the game gorgeous to look at, with a perfect Hawaiian sunset painted in the backdrop, but the Aloha! Cluster Pays slot also offers a generous return-to-player value of 96.42%! 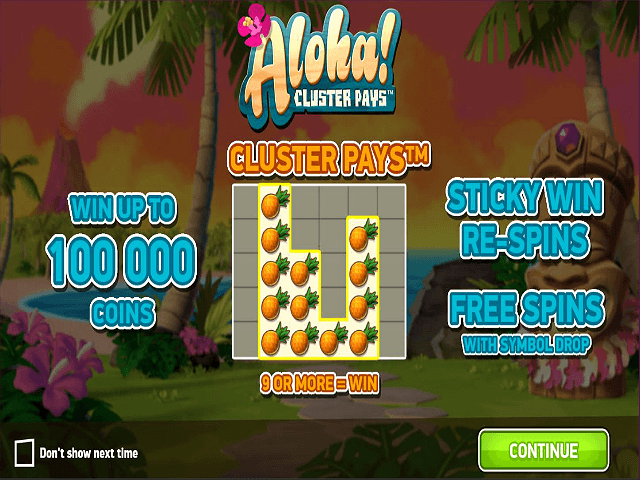 The typical online slot rules are thrown out of the window with Aloha! Cluster Pays as soon as you land on this tranquil Pacific paradise. Instead of paylines and reels (the two most common features among modern day online slot games), the Aloha! 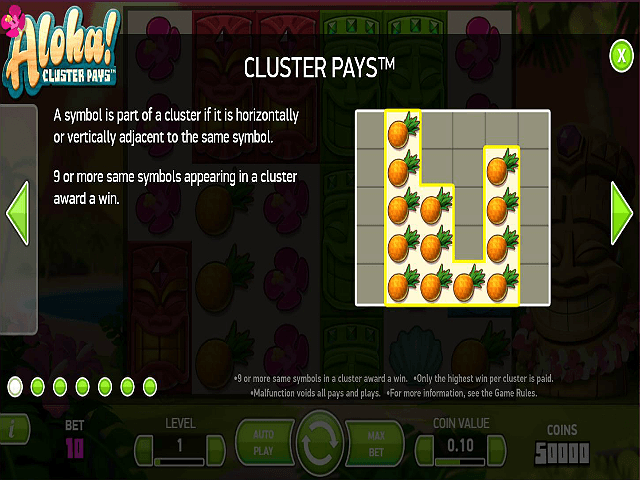 Cluster Pays slot requires you to form clusters of symbols, with a minimum of nine in order to win, a massive break from traditional slot gameplay. These clusters can take any shape across the 30 squares, as long as the icons are connected. NetEnt sets this out clearly in the Aloha! Cluster Pays slot instructions for players looking to better understand the unique rules. Aloha! Cluster Pays has a great selection of slot game symbols that tie nicely into the Hawaiian theme, including pink flowers, turquoise sea shells, coconuts and pineapples. All of these small icons pay a maximum of 2,000x the initial bet if a full cluster of 30 is formed across the board. Forming clusters is easier thanks to the Tiki head symbols, which take up two spaces instead of one. The cheeky blue and grinning green statues pay out a maximum of 5,000x the initial bet, but it's the smiling red statue that you want to keep your eye out for. A full cluster of this guy will pay out a massive 10,000x the wager, an unmatched number when compared to your average slot games. To make life more relaxing while you visit this holiday island, Substitution symbols appear, and will take the shape of the adjacent symbol that forms the highest possible winning cluster. Another feature that makes for more success is the Sticky Win Re-spin. This bonus randomly activates after a cluster win. The winning cluster is held in place, while the other symbols respin. If you increase the cluster size, you get another go. Free spin symbols also appear randomly throughout the game, and even if they're only half-visible, they still count. Even better, during the Free Spins session, there's a Symbol Drop mechanic that removes lower-scoring icons, making the chance of a bigger win all the more likely on the Aloha! Cluster Pays online slot. Share this Aloha! Cluster Pays Review today! If you like Aloha! Cluster Pays, you'll love these slot titles too!